1. The Question: Why Does God Permit Evil? 2. Does the Theist Contradict Himself? 3. Can We Show That There Is No Inconsistency Here? 5. Was It within God's Power to Create Any Possible World He Pleased? 9. Is God's Existence Compatible with the Amount of Moral Evil the World Contains? 10. Is God's Existence Compatible with Natural Evil? 11. Does the Existence of Evil Make It Unlikely That God Exists? 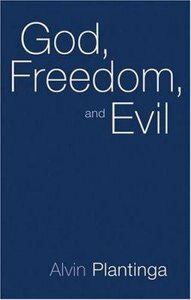 About "God, Freedom and Evil"
God, Freedom and Evil discusses and exemplifies philosophy of religion or philosophical reflection on central themes of religion. Alvin Plantinga (PhD., Yale) is John A. O'Brien Professor of Philosophy at the University of Notre Dame is one of the most distinguished living Christian Philosophers. His original contribution to philosophy is found in his trilogy Warranted Christian Belief, Warrant: The Current Debate, and Warrant and Proper Function (all from Oxford University Press)), his other books include The Nature of Necessity (OUP 1979), God and Other Minds (Eerdmans), The Analytic Theist (Eerdmans), and Does God have a nature? Customer Reviews For "God, Freedom and Evil"
I would love to give this book five stars, but, alas, I can't. There are major theological points that are left out in this book, but I don't think that we could expect too much more in a book on natural theology. Plantinga skips almost no steps in his reasoning, which will assure thoughtful readers, concluding that belief in God is very reasonable indeed. It is not a particularly difficult book; it only requires that you concentrate and "think hard" on what is presented. Please read this book.